Your first dental visit is now history. You selected your favorite dentist, filled out a bunch of paperwork and insurance information, had an initial exam, teeth cleaning and X-rays. Now it’s six months later and it is time for a check-up. You are feeling great but your teeth are getting a little dingy. So what happens now? You are cheerfully greeted by the receptionist and she notifies the hygienist that you have arrived. Shortly, the hygienist meets you in the lobby, introduces herself and escorts you to the exam room. When you are comfortable, she will ask you about changes in your health and if you are taking any new medications. Confirming allergies, any recent illnesses or chronic diseases will give her a picture of your current health status. Be sure to discuss any anxieties you have regarding dental treatment. Do you have any dental concerns? How are your teeth feeling? She will update your chart with your answers. The tiny chain around your neck is now holding a paper bib. Her hands are donned with gloves, mouth and nose are covered in a disposable mask and you both are wearing goggles. She will examine your teeth for plaque and alert the dentist to any cracked teeth, broken fillings or any other noticeable problems Your oral hygiene habits will be discussed and the best method of flossing will be demonstrated after the cleaning. 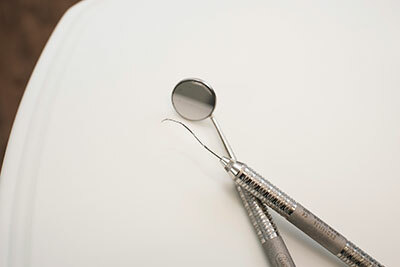 The cleaning will begin with a scaler, a metal instrument used to scrape off plaque and tartar above and below the gumline. Some dentists use an ultrasonic vibrating device to shake loose the plaque and tartar, which you then rinse away with water. To give your clean teeth a smooth shiny finish, a tooth polisher with a rotating rubber cup or brush coated with an abrasive paste (you can often choose the flavor of the paste) will whisk away any missed particles. Your teeth will now be professionally flossed between and around each tooth. Now that your teeth are clean and shiny the hygienist lets the dentist know you are ready for your exam. The dentist will introduce herself, listen to information the hygienist offers regarding your concerns and any tooth or gum issues discovered during her exam. The dentist’s exam begins as she picks up a metal probe with an angled mirror that enables her to see behind teeth and gums and check the condition of your tooth enamel. She is looking for swelling or redness of your gums, mouth sores, damaged fillings or loose teeth. Using a probe, the periodontal pockets, the spaces between the top of the gumline and where the gum firmly attaches to the tooth will be measured. Deeper pockets can be a sign of gum disease. She will verify that your upper and lower teeth come together properly, look for evidence of teeth grinding and check for any temporomandibular joint problems (the connection of the lower jaw to the skull). She will examine your neck, lymph glands, palate, tongue,cheeks, lips and floor of the mouth for signs of infection or oral cancer. Your dentist may want to take X-rays at this point to see if there are any trouble areas not visible during the exam. Be sure, at this time, to let the dental professionals know if you are or think you may be pregnant. Decay between teeth or around an old filling, abscesses, impacted teeth, cysts or tumors are difficult to spot without an x-ray . First a heavy lead apron will be placed over you. Then a piece of special plastic will be placed in your mouth and you will be asked to bite down to hold it in place. The x-ray machine will be placed against your cheek and you will hear a brief buzz sound. You will do this for each side of your mouth. The image will show your teeth, their roots and your jaw bone. Another type of X-ray, Panoramic, shows your complete upper and lower jaw in a single picture and it helps your dentist better understand your bite and the relationship between different teeth and your arch. After reviewing exam notes and X-rays your dentist has a thorough picture of your mouth. A treatment plan will be printed and discussed with you regarding any problem areas of your mouth. Let us help you bring back your teeth and gums to health by replacing cavities with dental fillings or missing teeth with restorative solutions. If you have dental insurance the printout will show how much they will pay and what your responsibility will be. This is another opportunity to ask any questions you may have about your dental care. The final step of your check-up is to schedule your next appointment at White Oak Family Dentistry in Garner, NC. If no repairs or treatment are needed at this time the receptionist can offer you days and times available for your next routine exam. Maintaining good oral health is your responsibility. We are here to assist you by offering expert dental care to protect and preserve your healthy smile. Scheduling is quick and easy when you call White Oak Family Dentistry at 919.986.0151. White Oak Family Dentistry provides top quality dental care to patients in Garner, Clayton, Raleigh and the surrounding area. We specialize in crowns, veneers, bridges and all types of dental hygiene and care with a true compassion for our patients' comfort and well being. Call us today at (919) 986-0151 to schedule and appointment.